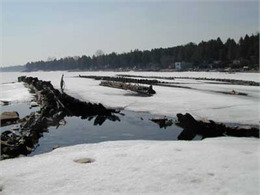 There are over 700 shipwrecks in Wisconsin rivers and lakes. Why is that number so high? Sturgeon Bay, Wisconsin. This bay is a boneyard for ships that carried limestone. At Bull Head Point, the skeletons of three shipwrecks can be seen sticking out of the water. Thick fog and low visibility caused ships to run aground or into each other. Captains made mistakes in navigating. Underwater obstacles ripped gashes in hulls. Some ships were old and leaky, while others had problems with engines that caused explosions. The most terrifying reason a ship could sink was probably fire. 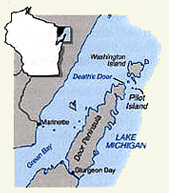 Death's Door is the chief navigational passage between the bay of Green Bay and Lake Michigan. Hundreds of vessels have been lost or damaged in the Death's Door passage -- despite lighthouses built on Plum Island (1848 and 1896) and Pilot Island (1850). Its swirling currents, howling winds, and rocky shores created conditions hazardous for all ships, and especially for sailing vessels. Some believed that Death's Door got its name after a large Indian war party and their canoes were destroyed there in a sudden storm. Early French and American travelers heard and repeated the legend about "a hundred Indians dashed against these rocks and killed in a single storm." Some thought French fur traders spread this story to keep others from coming to the area. In fact, the name "Death's Door" comes from the French name, Porte des Morts. In September 1856, the steam-powered ship "Niagara" left Sheboygan carrying passengers and cargo 30 miles to Port Washington. Not long after leaving the dock, fire broke out. Within minutes, the engines quit, the giant paddlewheels halted, and the center portion of the boat was engulfed in flames. The vessel was stuck, helpless more than five miles offshore. Most of the crew was trapped forward, and most passengers trapped in the stern. Frantic passengers attempted to launch lifeboats themselves, and two were capsized. In the stern, the crew began breaking off cabin doors and throwing them and other buoyant items into the water. Like many other boats of the day, the Niagara carried no life preservers. Survivors estimated that it took only 20 minutes for passengers to abandon the ship once news of the fire broke out. It was one of Wisconsin's deadliest transportation disasters. Over 60 people died. The phrase "gales of November" refers to the fierce storms that hit the Great Lakes in late fall. Their heavy winds, blinding snowstorms, and huge waves make October and November the most dangerous time of year to sail. One cold October night in 1891, the schooner "Forest" entered Death's Door passage at the tip of the Door Peninsula. A fierce gale struck and drove the ship onto the reef at Pilot Island. The next day, the crew rowed to shore and the safety of the lighthouse. The Gilmore, Nichols and Forest wrecked at Pilot Island. This unique photograph reveals the dangers of passing through Death's Door. On October 17, 1892, the "J.E. Gilmore" entered the passage in heavy, shifting winds and was blown onto the reef. The crew waited out the storm on board, and then they were rescued by the lighthouse crew.The next year, two more schooners were wrecked at the same spot less than two weeks apart. On October 28, fierce winds and blinding snow struck the "A.P. Nichols." The winds tore apart her rigging and drove her onto the rocks near the shipwrecked "Gilmore" and "Forest." In a dangerous rescue, the lighthouse crew helped the sailors leap from the rolling "Nichols" onto the icy deck of the wrecked Forest and then on to Pilot Island. Luckily, no lives were lost in any of the three shipwrecks.